Although gold is a highly cherished metal in contemporary society, this was not always the case for ancient Americans. At different points in history; feathers, shells, jade, textiles, and so forth were as much, if not more than valuable to ancient Americans. Depending on the native peoples, the curators of Golden Kingdoms: Luxury and Legacy in the Ancient Americas believe that additional materials were also thought to be greatly fitting for the production of luxury. 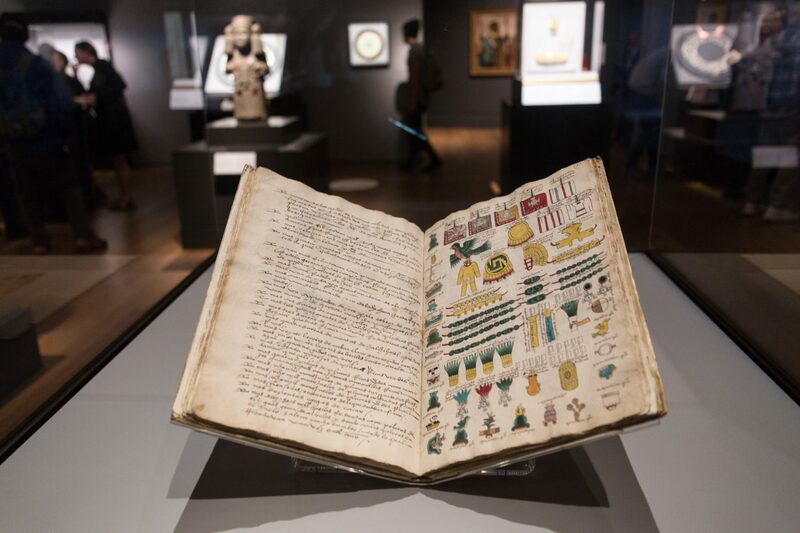 The Golden Kingdoms exhibition takes visitors through a progression of time, starting with the earliest works bore from the south of Peru and finishing with the latest artworks from Northern Mexico. It follows the growth of art in luxury in the Americas around 1200 BC to the early sixteenth century when European colonization took place. 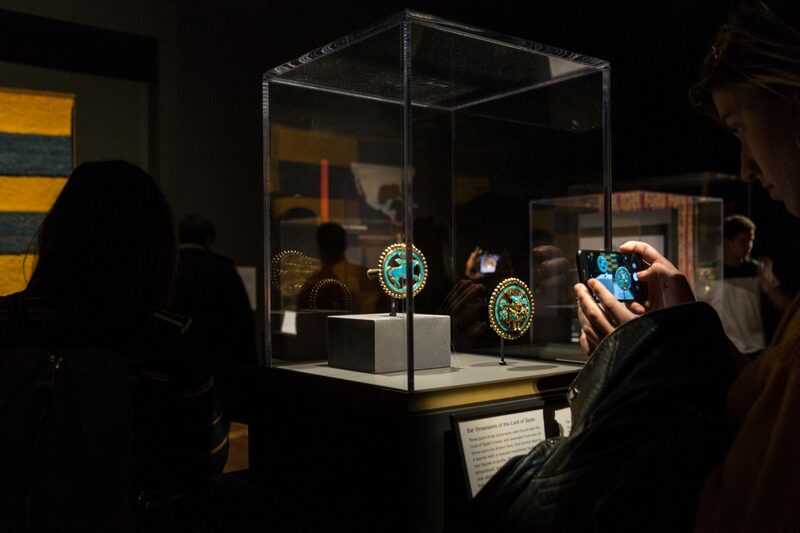 As previously stated, the exhibition primarily focuses its attention to the fact that ancient Americans, unlike European conquerors, did not find gold to be the most valuable material. 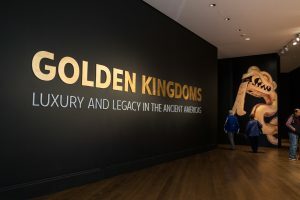 Golden Kingdoms, located at the Getty Center, was co-curated by Kim N. Richter from the Getty Research Institute and Joanne Pillsbury from the Metropolitan Museum of Art. The exhibit consists of numerous masterpieces from various lenders. A large amount of these fine masterpieces include jewelry, cups, plaques, ceremonial tools, funerary masks, and so on. This show is a part of the Pacific Standard Time: LA/LA, which is an expedition of Latin American and Latino art led by the Getty. Pacific Standard Time: LA/LA will take place from September 2017 through January 2018 at over 70 different institutions all across Southern California. Several works demonstrated in the exhibit were handed down over generations and sent to great lengths as funerary backgrounds, heirlooms, and votive offerings. These works were not only used as a means by which ideas became interchanged throughout time, but were also made and utilized to inspire sacred power among those who used them. Instead of creating tools and weapons made of their culture’s most prized materials, craftspeople in the ancient Americas often created luxurious objects for rituals and coronations. The narrative and the name of the exhibition draws attention to the gold element, but the objects displayed in the show and the enlightenment that comes along with them is a counter-narrative. Jade, feathers, and turquoise were among the most highly valued materials in Mesoamerica. Jade, instead of gold, was the most treasured material to the Olmecs and the Maya, and as for the Incas feathers and textiles were valued more so than anything else. Conceivably, the most eye-catching pieces of work in the exhibit are not made of gold, but of other substances due to their color and radiance. These masterpieces, made of priceless metals and supplementary substances, influence visitors to reimagine the value of different materials. Encouraging the public to question widely accepted narratives about Latin America is the basis of which Pacific Standard Time: LA/LA is founded upon. It aims to showcase to the public what has yet to be seen as well as raising awareness to complex and controversial issues throughout the Americas by providing insight to the values of different cultures.